You'll be £20.00 closer to your next £10.00 credit when you purchase The Roots of Ireland's Troubles. What's this? Order within the next 4 hours, 46 minutes to get your order processed the next working day! If the objective of colonisation should be the establishment of economic benefit, in Ireland it was to enforce order. Settlers were required to usurp the traditional lands of its indigenous population. Their attempts to enforce Protestantism in all its forms onto the dogmatically Catholic locality were doomed to failure. With unrest continuing, Ireland became the battleground for the English Civil War fought out between Royalist and Parliamentarian to the detriment of its people. The availability of cheap Irish labour soon led to calls to protect English agricultural prices. Fears that Irish goods would undercut English production costs led to calls to prevent the development of an Irish industrial revolution, despite the desperate need to employ the surplus rural population. This inevitably led to famine. No one believed the problem which was unfolding despite all the efforts of Nationalist politicians. English land owners in Parliament were only concerned to protect landlord interests and to score points off their political opponents. If home rule could not be delivered by political means, it was inevitable that it would be delivered by force. 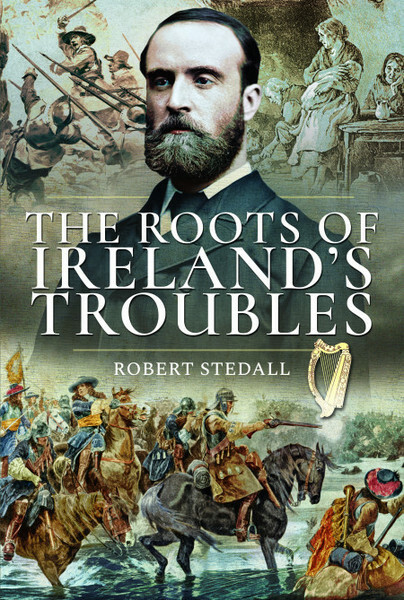 Inextricably linked with the history of Britain, Stedall guides the reader through Ireland’s turbulent but rich history. To understand the causes behind the twentieth-century conflict, which continues to resonate today, we must look to the long arc of history in order to truly understand the historical roots of a nation’s conflict. Robert Stedall lives near Petworth and was educated at Marlborough College and McGill University in Montreal. He is a retired chartered accountant and finance director. He takes a broad interest in genealogy with a particular interest in the Scottish peerage. He wrote a history of his own family, ‘Hunting from Hampstead’, published by the Book Guild in 2002. More recently he has produced a two volume history of Mary Queen of Scots and her son James VI,The Challenge to the Crown (2012) and the Survival of the Crown (2014), both published by the Book Guild. These make a fresh assessment of the events surrounding Lord Darnley’s murder. His website www.maryqueenofscots.net has become a focal point for those studying Mary’s life. He was Master of the Ironmongers’ Livery Company in 1989 and has most recently produced a history of the London Livery Companies on their estates in County Londonderry. This was published by Austin Macauley in 2016.